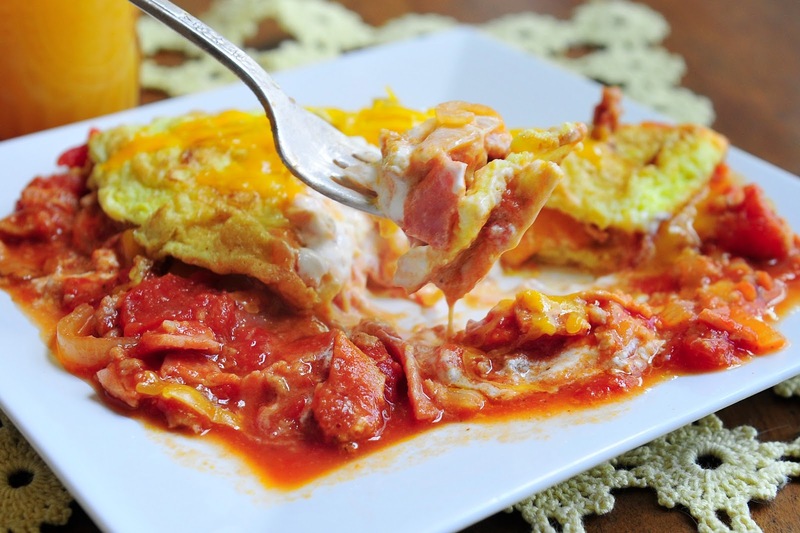 This recipe for Reno Omelet is one that my family would serve in their restaurants. We were known for our huge 6 egg omeletes. Many patrons would share because, lets face it, 6 eggs is a lot to eat. On rare occasions we would be met by a challenger who would eat the entire omelet, the hash browns, toast and 10 cups of coffee. These were usually men who spent their days behind the wheel of a logging truck. We lived in the hills of Oregon and the logging industry was still very active and a huge part of my town growing up. These are sweet memories of riding my bikes along the logging roads with my cousins and family. These roads are all closed down now because the mills are no longer functioning. On our menu, we had a variety of omelets to choose from: Denver, Seafood, Reno and The Spanish are just a few. This is by far my favorite. I love the combination of pork and the different cuts of meat. I also like the red tomato base sauce. Combine this with cheddar cheese and a dollop of sour cream and you will eat like a king or queen. This recipe makes a large amount. This is great because you can freeze half for a later time or eat it in a week like my family does. We don't tire of this at all. The sausage that I recommend in the list of ingredients is purchased at Whole Foods in their meat section. The reason I am making note of this is because they are large. I would say 1.5 inches by 6-7 inches long. If you purchase sausage that is not this size then you would want to make some adjustments. I also don't make 6 egg omelets at my home. I use 2 eggs, slightly whisked and poured into a hot cast iron pan that has a bit of melted butter in the bottom. You can also use a non stick or omelet pan to make your eggs. I like a dry omelet, this means that I cook one side and then flip it so that my omelet does not have any runny eggs (I don't like this at all). At this time I will add my cheese and warmed Reno mix then top with sour cream. Flip the right side over the fixings and slide to a plate. 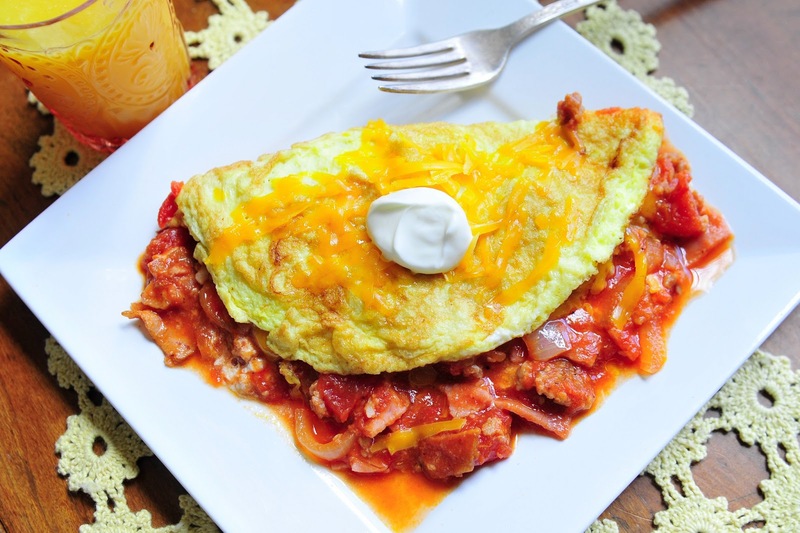 You can top the omelet with more cheese and sour cream too. I hope you enjoy this delicious recipe that is wonderful for breakfast, lunch or dinner! After all your meat is cooked, diced and sliced add this to a large stock pot. Add sliced onion. Let the onions and meat cook together on medium heat until the onions are soft. 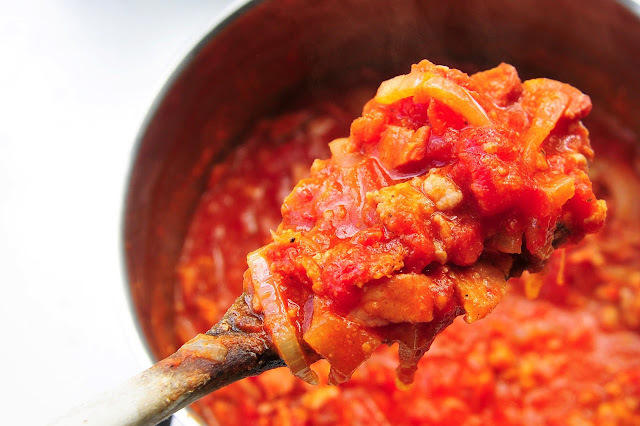 Add diced tomatoes and tomato sauce. Let simmer and then portion up and freeze or refrigerate. I usually let this simmer on low for 45 minutes, stirring every 15 minutes. Warm before serving in omelet if not using right away. I like this omelet served with Sharp Cheddar Cheese and sour cream. To make omelet: See above. I think all my boys will feel like they've died and gone to Heaven when I make this! Sounds absolutely amazing.